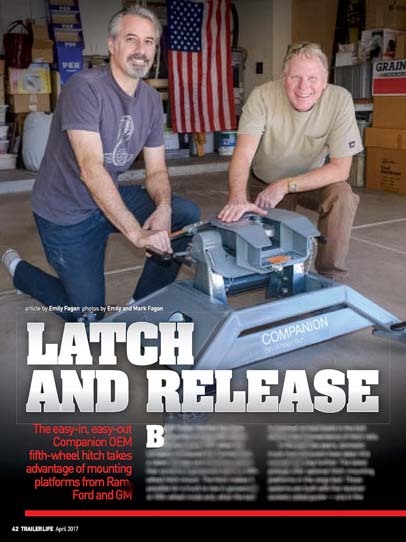 The April 2017 issue of Trailer Life magazine featured our article on the new Companion OEM fifth wheel hitch from B&W Trailer Hitches. 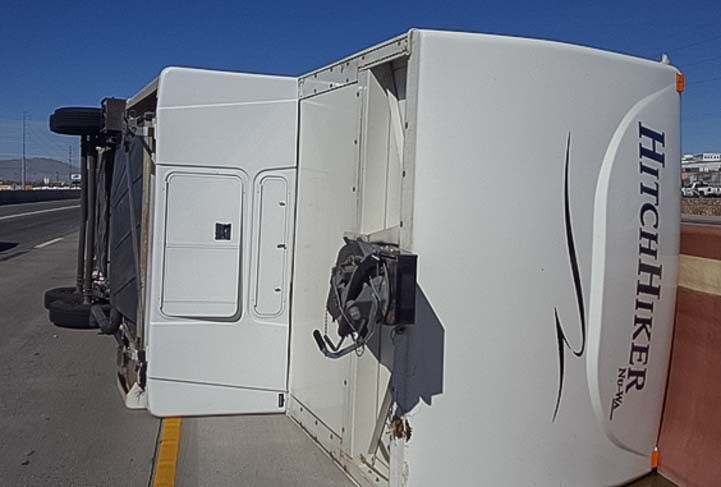 Ironically, just as that issue came out, a reader emailed us the harrowing tale of his recent fifth wheel trailer rollover accident. Trailer Life Magazine, April 2017. Text and photos by Emily Fagan. Installation by Mark Fagan and Mark Graika. Like most RVers, we installed our hitch without giving much thought to rollover accidents, and we have been very happy with it. The B&W Companion OEM fifth wheel hitch is special because it is designed to fit into the new puck sytems that the diesel truck manufacturers are now making available in the beds of their pickup trucks. 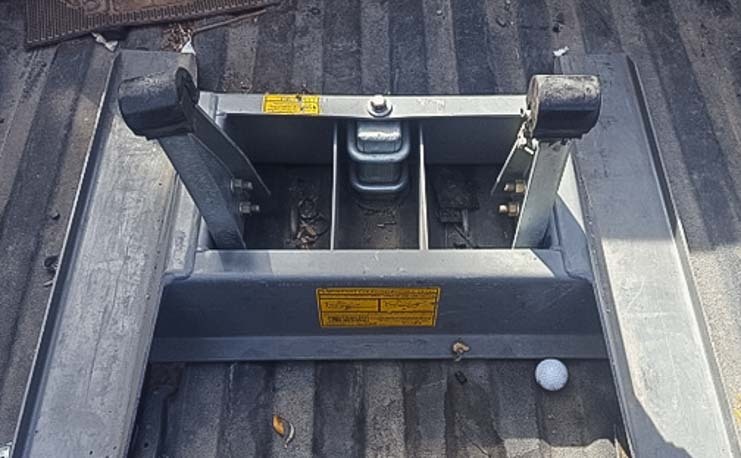 This makes it easy to install the hitch in the truck without having to take the truck to a shop. The other fabulous thing about the B&W Companion OEM hitch is that not only is it easy to install but it is easy to remove from the truck. Anytime you want to use the bed of your truck to haul something big like lumber, fire wood or furniture, it is a very straight forward process to take the hitch out of the truck. The best part is that there are no hitch rails in the bed of the truck, so once the hitch is removed, the bed of the truck is totally flat. These features are not part of the design of conventional fifth wheel hitches, like the conventional rails-based B&W Companion hitch (not an “OEM” model), so it’s a worthwhile to consider buying a truck with the optional puck system on it if you are considering buying a late model diesel truck. 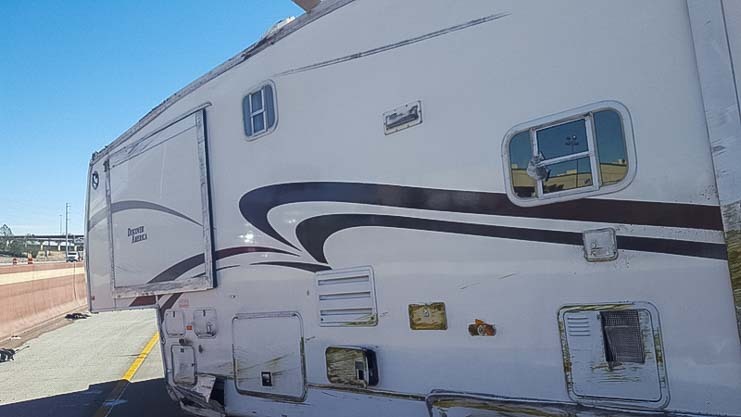 We were shocked when full-time RVers Mark and Doran Gipson sent us photos of their terrifying rollover accident with their fifth wheel. 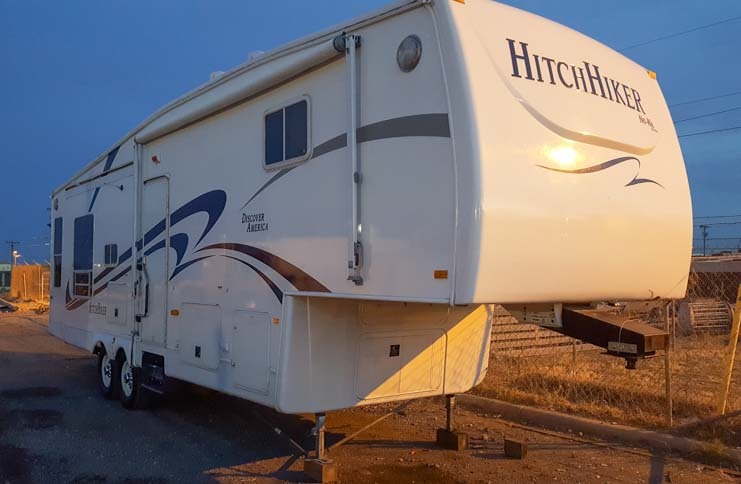 They were towing their home, a 2007 32′ Hitchhiker Discover America fifth wheel, with a 2008 Dodge Ram 2500, and they were hitched together with B&W Companion hitch. While driving at 60 mph on I-10 outside in El Paso in February, two very inconsiderate drivers suddenly cut them off in a series of swerves right in front of them. The result was that the trailer went over on the driver’s side at 60 mph, slid 150 feet and hit its roof on the concrete median. 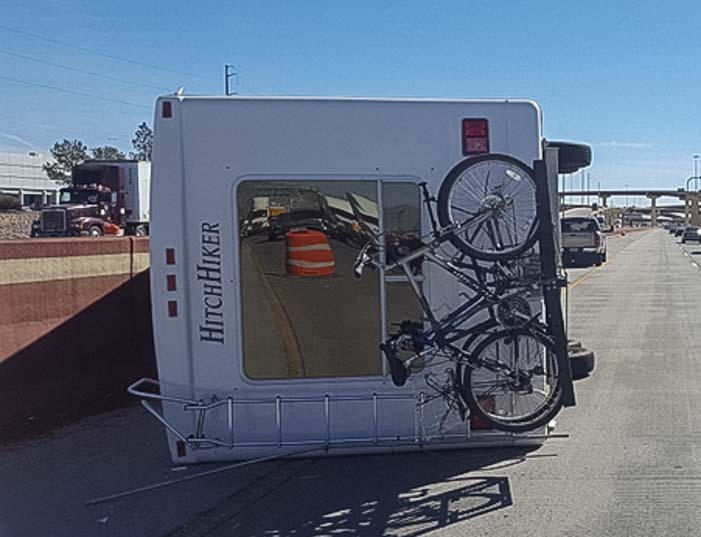 The Hitchhiker fifth wheel hit the pavement at 60 mph and slid 150 feet. Most trailers would have splintered on impact. Fortunately, as the trailer went over on its side, the B&W hitch — which comes in two pieces: a base on the bottom and a coupler on the top — separated in two. 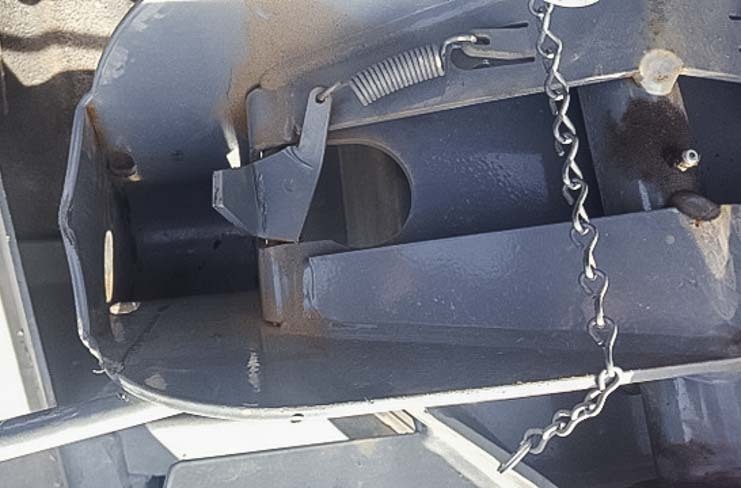 The coupler stayed attached to the trailer’s king pin as the trailer toppled over while the base stayed in the bed of the truck, allowing the truck to remain upright. as it rolled over on the driver’s side. So, while Mark and Doran came to a skidding stop in their truck, sitting upright in their seats, the trailer rolled over, detached and slid to a stop on its side. As the trailer went over, the fifth wheel overhang crushed the driver’s side of the truck bed. If the truck had rolled over too, Mark and Doran could have easily been very badly injured or even killed. However, because the truck stayed upright, they walked away unscathed. Thank heavens!! “The wrecker driver came with two trucks and a trailer because he had not gotten to a 5th wheel rollover without the truck also on its side and the trailer in pieces. He said that it would collapse when he tried to pick it up. But he put it on its wheels and towed it to his shop and still can’t believe how well built it was. The wrecking crew righted the trailer and were amazed that it stood up just fine on its own wheels. The damage to the trailer was cosmetic except for a roof rafter. My husband Mark and I saw a trailer accident on the highway once, and the entire trailer was in splinters. That is what usually happens in trailer accidents and that’s why the wrecker driver arrived at the accident scene prepared to pick up a million pieces off the highway. The wrecking crew expected the trailer to fall apart when it was righted, but it stood right up. They towed it away on its own wheels just fine. It is quite a testament to the way the Hitchhiker Discover America trailers were built that one could fall over on its side at 60 mph and still be intact with the slide-out mechanisms still functioning and only cosmetic damage on the side that skidded on the asphalt. 2015 – A boatload of trailer repairs at the NuWa Service Center. B&W Trailer Hitches is located just a few miles away from the NuWa plant (NuWa is now called Kansas RV Center) in Humboldt, Kansas, and we enjoyed a wonderful factory tour and a unique American heartland small town celebration that was sponsored in part by B&W Trailer Hitches two years ago (blog post here). 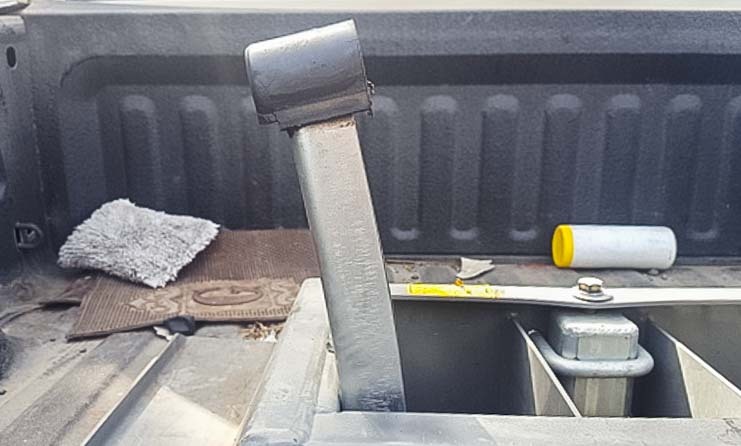 For Mark and Doran, the key to their truck staying upright during their rollover accident was the way the pivot arm on the base of the B&W Companion hitch bent sideways and let the coupler break free as the trailer toppled over. Looking forward towards the cab of the truck, the pivot arm on the driver’s side bent outwards allowing the coupler to break free (with some small broken parts inside) while the entire hitch base stayed planted in the bed of the truck. This kept the truck upright. Bent pivot arm on the fifth wheel hitch base. 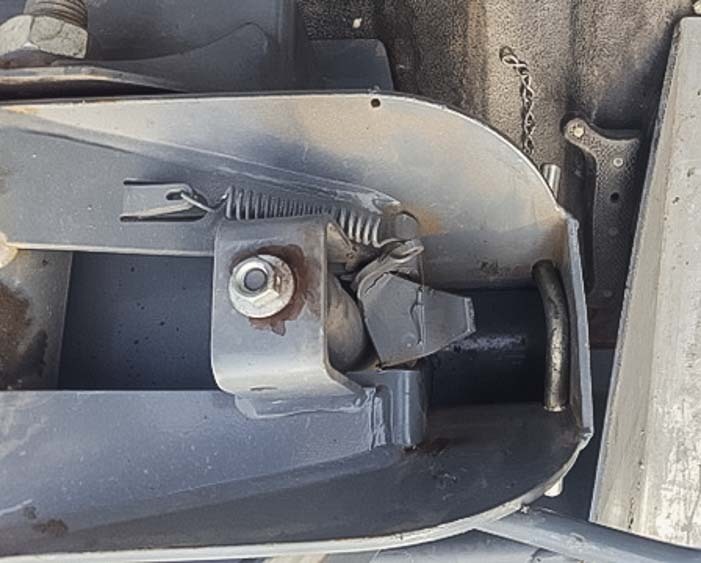 It is impressive that the B&W hitch allowed for the hitch coupler and hitch base to separate completely once one of the pivot arms on the hitch base began to bend as the trailer went over. As the wrecker driver noted, usually both the truck and the trailer roll over together because once the trailer starts to go over the hitch forces the truck over too. The coupler stayed attached to the trailer’s king pin. 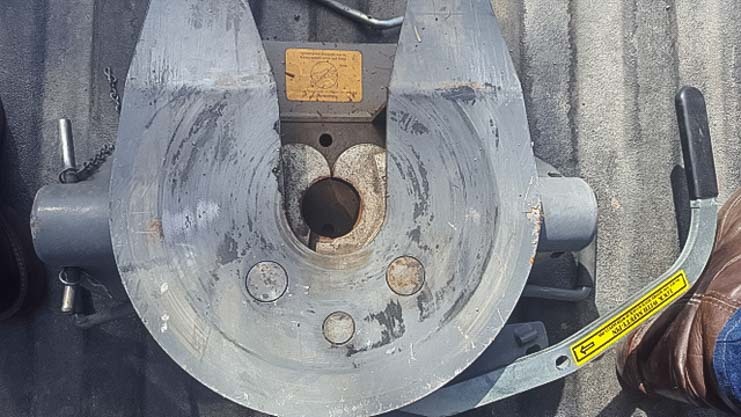 In this photo it has been removed from the king pin and laid in the bed of the truck for inspection. The coupler is flipped upside down here to reveal the broken pieces inside. 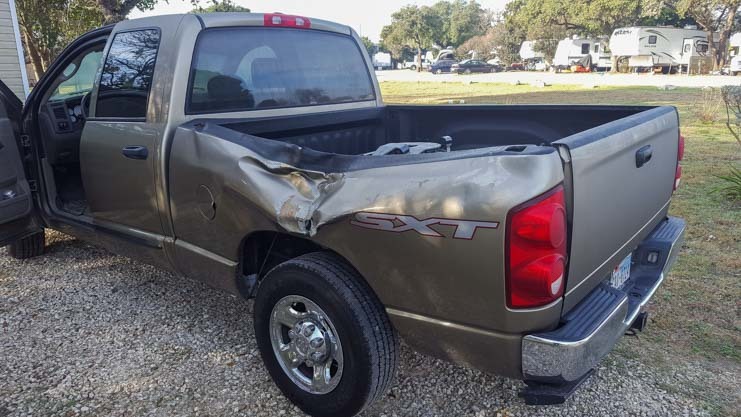 In the end, Mark and Doran decided to replace both their truck (a 2008 Dodge Ram 2500) and their trailer (a 2007 32′ Hitchhiker Discover America) as well as their slightly damaged B&W Companion hitch with a new set: a 2012 3500 Ram dually truck, 2012 36′ Hitchhiker Discover America and a new B&W Companion hitch! We feel very blessed to have towed our fifth wheel trailer so many tens of thousands of miles and seen so many beautiful places in nearly 10 years of full-time travel. We’ve had our share of near misses, especially in our trip back east two years ago where traffic is blindingly fast on very crowded and confusing highways, and we’ve seen our share of accidents too. One RV upgrade we did that has made a massive difference for us in dealing with sudden stops at high speed while towing our 36′ 14k lb. fifth wheel trailer was a trailer disc brake conversion where we upgraded from standard trailer drum brakes to electric over hydraulic disc brakes. This is a pricey upgrade, but one we highly recommend doing. 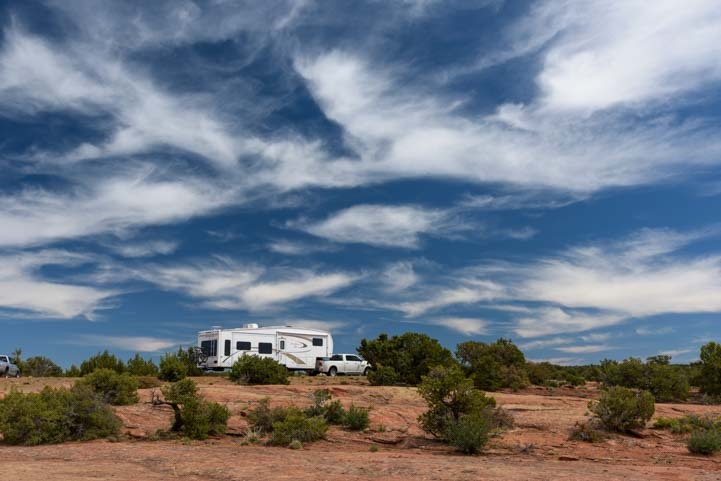 RVing in a fifth wheel trailer is so much fun, especially in gorgeous places far from the open road. But accidents do happen and good equipment — from truck to trailer, hitch and brakes — can make a huge difference in the outcome when things go wrong. 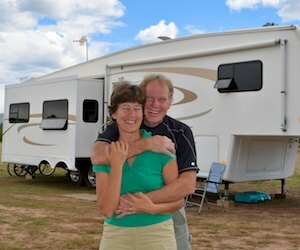 This entry was posted in RV & Boat Projects & Upgrades and tagged New, Non-Travel, RV Tech Tips, RV Tech Tips Truck, RV Technical Topics, Truck Trailer Hitch by Roads Less Traveled. Bookmark the permalink. You scared the hell out of us, M! Fortunately, it wasn’t you and your Mark, and more fortunately, the other Mark and his wife were safe, thanks to good equipment, and a lot of good luck. Too bad Nu-wa bit the recession/depression bullet, as they are fine coaches. We see a lot of junk on the road these days, and the quality of 5vers – we own a 2008 34 ft Montana – is dropping like a rock, except maybe for high end coaches. Maybe. And their bike rack hung together, too, which is remarkable! Getting ready to leave on our adventure to the North – from Aryzona; through Nevada, Northern Californy, Oregon, and Washington, returning later in the year, through Idaho and Utah. Had to dig through your past articles to plan routes, and find places to stay, since a lot of RV Parks have turned into trash parks, due to folks who can’t afford housing, who are using affordable RV Parks, as a permanent residence. Similar to Hobo jungles in many years past. Glad to see you’re see you and Mark are booking around, M, and still writing great stories, with your wonderful pictures. Keep up your wonderful work…and be safe! And yes, we are leaving the desert, later than what we hoped too, but life still gets in the way of plans, sometimes, doesn’t it? …..Bette & Glen Horsmann, from Sun CIty, Aryzona. Mark and Doran were very fortunate to be able to walk away from an accident like this. Thank heavens they were okay. The roads are definitely busier and the campgrounds and RV parks are very busy too these days. We just left an area that had 3 people camping/hiking in it five years ago and had 15 people in it today. As for campgrounds, I think the quality of each campground and park is really up to the individual management at the park. Some NPS and USFS parks are phenomenal and some aren’t, and the same goes for private parks. State parks are usually the nicest but they are also very expensive and generally don’t have dry camping options any more. Each campground or RV park is its own little enterprise and if the leadership is good, then it will be well run, just like any company. In Arizona, we talked at length with a private RV park owner in a small town who said the recent state-wide minimum wage hike has affected his business very badly. He has had to raise his rates to cover payroll and won’t be able to give his workers the very generous Christmas bonus that has always been his tradition. By the time the new minimum wage hike is completed next year, his longtime workers will have had a 50% wage hike. Since we boondock every night we’ve seen lots of people living out of their cars ever since we started, but I think the worst time for that (that we saw) was in 2009-11 when the recession was in full swing and so many people were losing their homes to foreclosures. Have fun in your travels this year and thank you for reading all our various goodies. Great article. I am glad Mark and Doran were able to walk away. We have a 2014 Dodge dually with a B&W hitch and we tow an Excel fifth wheel. This article makes my peace of mind go up a bit. We love our hitch. It is so easy to maneuver. Thanks for another great article. The B&W hitches are terrific, Sherri, and so are Excel fifth wheels. Lucky you! I sure wish Peterson Industries was still building those beautiful fifth wheels too… sigh. Thank you, Marcel. We miss you two!! That’s an interesting story for an old state trooper who handled probably thousands of accidents over 28 years, but never a camper trailer or self propelled….thankfully. I’m glad to hear the people were okay and the truck did not go over with the trailer. You’re lucky never to have had to pick up the pieces after a trailer or motorhome rollover accident in all those years of being a state trooper, Pete, and we’re so relieved that these good folks survived just fine…!